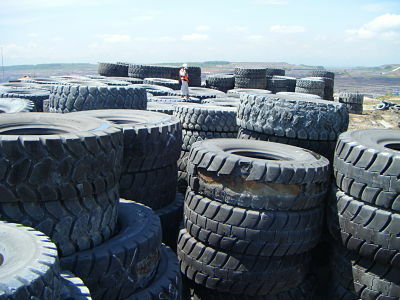 There’s no denying the national scourge of tyre dumping and disposal is a massive environmental problem, but magnify rubber radials to the size of those used on gigantic mining trucks, earth-movers and big tractors and you’ve literally got a monster-size problem. As Australia’s mining boom cools, resources companies and local councils are being forced to grapple with how to safely and sustainably deal with the estimated 155,000 tonnes of giant rubber – known as Off the Road Tyres or OTRs – discarded each year which are just too big and expensive to move. Big tyres claim a big chunk of tyre waste stream too, making the problem of OTR disposal as colossal as the giant rubber wheels themselves. 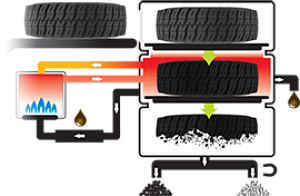 Government commissioned research estimates OTRs make-up close to a third of the toxic spent tyre load, proving size really does matter. Worse still, OTRs are so big and so heavy that the main way miners get rid of them is by digging an even bigger hole on-site and then just dumping them there – hardly an environmentally sensitive solution. 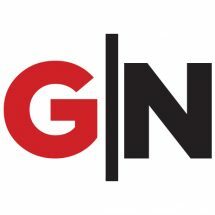 Australia recycling company, Green Distillation Technologies (GDT) – which first came to attention for pioneering a method to chemically deconstruct old tyres into re-usable oil, carbon and steel – has declared it’s going to try and hit the big time with its unique re-processing approach. 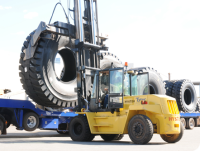 Craig Dunn, GDT’s chief executive, told Government News his company has signed a deal with Tytec Logistics, which deals with big-tyre logistics and remanufacturing, to try and find a way to deconstruct big rubber by applying his company’s technology. Dunn says that although GDT’s everyday tyre recycling technology is proven, the handling of the oversize tyres so far isn’t – a situation that presents a big opportunity to build a commercial prototype. “Currently there are no means of recycling these very large tyres and the usual means of disposal is burial in a dump on the mine site, or in an EPA nominated dump,” Dunn says. 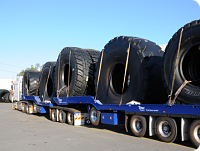 “The test plant for the world’s first processing plant for OTR tyres is being built at the GDT complex in Warren, Western New South Wales, with the first OTR operating plant to be built in Perth in 2017. The commercial incentive to be able to break down big tyres isn’t hard to figure out. According to GDT, a tyre that weighs 3.5 tonnes that is broken down using its processes can give back 1500 litres of oil, 1.5 tonnes of carbon plus the steel reinforcing that goes back to the tyre manufacturer for reuse. buried in mega graveyards all over the world. Dunn sees strong export potential. “We believe that after the first operating plant has been built in Perth, there will be a need for other OTR plants in Australia, as well as the United States and South America,” Dunn says. If that comes off, it could be a lucrative as well as sustainable innovation that bubbles for years to come. We have the same problem in South Africa and we are also looking for a solution. Any machines currently available?